At the time these data were collected, abortions at one of New Brunswick’s three providers were not publicly funded. PEI had no providers. PEI now has abortion services. Source: CICH graphic using data adapted from Statistics Canada and Action Canada for Sexual Health as cited in Provider patchwork: How abortion access varies across Canada, by Anna Mehler Paperny, January 4, 2016. http://globalnews.ca/news/2390226/provider-patchwork-how-abortion-access-varies-across-canada/ -accessed August 31, 2017. 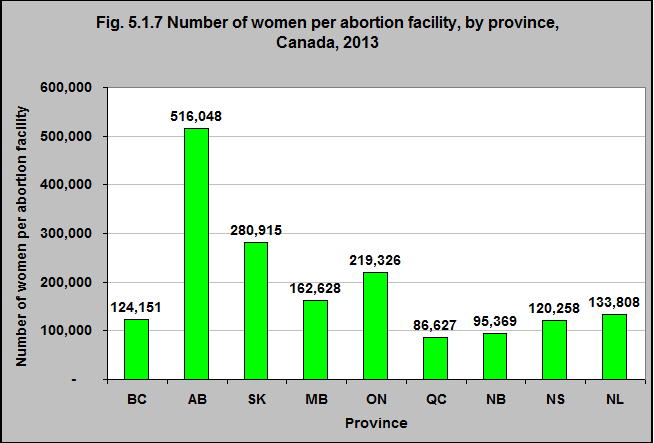 Access to abortion facilities varies between provinces and territories. In 2013, there was one abortion facility for every 516,048 women in Alberta and one for every 86,627 women in Québec.